As the state of the economy is ever changing, reshoring continues to be a hot topic in the manufacturing industry. You may have seen one of our most popular posts on reshoring called “Moving to the States, Time for Reshoring”. The latest trends towards reshoring remain strong and according to Assembly Magazine are at ‘record levels.’ Star Thermoplastics routinely talks with manufacturers that either have brought business back to the United States, are in the process of doing so or are considering it. It is one topic that we are passionate about. We are familiar with the reasons for offshoring operations such as reduced labor cost, reduced lead times for raw material supplies, increased profits, tax breaks or benefits and more. While the trend was moving toward offshoring years ago, we have since seen the consumer mentality shift, resulting in a more conscious buyer. The downsides of offshoring have become clear over time – longer delivery times for finished goods, long distance operations that are difficult to manage, language barriers, and complex supply chains. 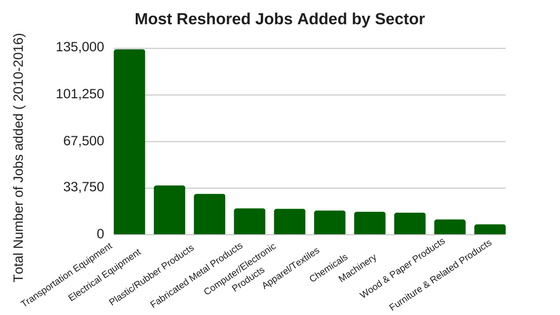 According to a report from the Reshoring Initiative the top 10 sectors have seen more than 302,000 jobs added. Nearly every state has seen some increase in jobs returning with the most significant upswing being seen by South Carolina, Tennessee and Georgia. So why are we now seeing jobs returning? There are a few key factors that have changed the appeal of offshoring operations. First, with labor costs steadily rising in many countries, the cost savings aren’t what they used to be. Many companies are finding that infrastructures from developing countries either can’t accommodate the needs of their operations or aren’t reliable enough, with power outages, natural disasters, and local politics affecting timeliness of production and delivery. Other things like changing government and trade agreements also have a big impact on operations. Where does it go from here? With the return of over 300,000 jobs we have seen and continue to see improvements in unemployment and local economies. Reshoring allows for a closer eye on innovation and development; when the process stays local there is a reduced risk associated with design complications, red tape, and overseas shipping. A survey from ThomasNet found that over 72% of buyers “always or generally” prefer to by local. People want to know who they are buying from and who they are supporting with their purchases. Consumers are no longer buying just a product, but your story, your purpose and your passion. Read about the Reshoring Initiative 2016 Data Report. Apply for the National Reshoring Award and learn more. 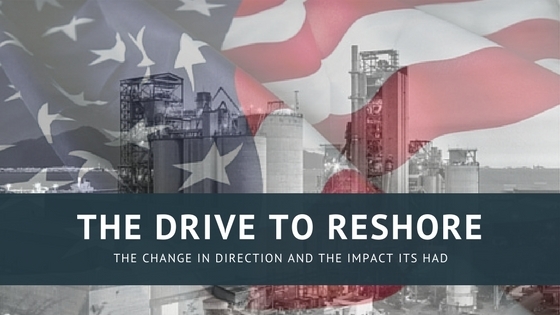 Learn more on the State of Manufacturing. Take part in the Return One Million Jobs campaign. Submit your reshoring story for publication. As an American company that is family owned for over 25 years, we know that it is the people who work on our team and the companies that we work with that have attributed to our years of success. We are proud to be an American manufacturer.